You may want to lube the chain on your garage door or where the garage door rubs the outer rubber weather-stripping. Maybe you want to lube the door lock on your truck. Or you have a stuck bolt or screw and the last thing you want to do is take a chance of breaking it off. The success of your project and your effort will depend on whether or not you choose the right “helper” in a can. CRC White Lithium Grease is a must-have lubricant for all car repair techs and do-it-yourselfers. Always have a can on hand in your home, garage or professional auto repair shop. If you need to lube the trailer ball on your rear bumper, the best choice is CRC White Lithium Grease. White Lithium Grease is a multi-purpose grease for metal-to-metal contact and moving metal parts. It is water and heat resistant and will not freeze, melt or run. Other uses include hinges, locks, latches, seat tracks, strike plates, cables, distributor cams, battery terminals, radio antennas, windshield wiper mechanisms, bolts, bearings, appliances, lawn and garden equipment, garage door tracks, chains, screws, guns, tools, machinery, fans, blowers, roller channels, chains, conveyors, gears, pneumatic tools, blades and bits. One thing to note is that white lithium grease will attract dirt. You would not use CRC White Lithium Grease to pack your vehicle’s wheel bearings or any bearings on your bicycle or motorcycle. CRC Heavy Duty Silicone is different from White Lithium Grease in one major way: Heavy Duty Silicone does not attract dirt or dust. So it is applicable for lubing items where you want to provide an invisible layer of lube that stays invisible. For example, you would use silicone to lube your hood or truck latch release, the track of your sunroof or sliding rear window on a pickup. Those are the types of places where you want that invisible lube. Around the house, Heavy Duty Silicone is great for sliding closet doors, slide window channels, drawer runners, metal hinges – even the hinges on your microwave door. Use it on any kind of seal or gasket and even the blades of your paper shredder. CRC Heavy Duty Silicone is a very versatile lubricant. It can stop rust and drive away moisture. It can waterproof a connection of wood, rubber, nylon and metal or be used as a lube for those same materials. It is odorless and can flow and protect from 40°F to 400°F. Silicone can also help repel water, so if you accidentally leave your good shovel out on a rainy day, it won't be ruined if you regularly spray the wooden handle with silicone. CRC Heavy Duty Silicone should not be used on plastics. CRC POWER LUBE is your all-around go-to lubricant. It’s a lube, penetrant, corrosion inhibitor and moisture displacer, all in one product. POWER LUBE stops squeaks and removes rust and corrosion. It can be used to soak, clean and loosen seized parts. It seals out and displaces moisture and prevents future corrosion. Spray POWER LUBE on the inside of your distributor cap to help keep moisture away from the contacts. POWER LUBE is a true multi-purpose lubricant, so you’ll find thousands of uses for this product at home and in your shop. Here are just a few: hinges, speedometer cables, seat slides, door locks, power antennas, wheels, lug nuts, battery terminals, air tools, switches, computers, clocks, firearms, fishing reels, bicycles… you get the picture. CRC ULTRA SCREWLOOSE is a no-compromise penetrant that attacks corrosion to free corroded fasteners and mechanical components. It’s a super-fast, powerful, concentrated penetrating solvent that instantly penetrates minute and tightly fitted crevices. Notice the word “solvent”. This is a heavy duty penetrant typically used and loved by exhaust repair shops and other car repair shops that have to deal with rusted suspension, steering and axle parts and even wheel studs and nuts. Because this super-fast penetrant contains petroleum distillates, it should not be sprayed on plastics or rubber. It is beyond my ability to remember the last time I had rubber or plastic stuck together and I used a product to get them apart, but you know… I had to say that. CRC FREEZE-OFF is different from all other penetrants. The “train” that carries the potent solvent blend to the rusted bolt is a powerful refrigerant. Because this product contains refrigerant, FREEZE-OFF actually drops the temperature of the stuck part so it can contract within its rusty cavern, and that allows the penetrant to slip in and lube the joint for easier removal. This is called 'freeze-cracking' the rust. FREEZE-OFF is a premium product and you’re not going to find another one like it. Don’t give up on those really tough jobs without trying FREEZE-OFF. You’ll be amazed at what this product can do! FREEZE-OFF is flammable and should not be used on plastics. In conclusion, to buy one can each of all of these CRC lubricants and penetrants may cost you somewhere in the range of $15-20 dollars. If you follow this usage advice, you’ll have a powerful set of “tools” to aid you in any job or repair. Mark Salem has owned and operated Salem Boys Auto in Tempe, Arizona since 1979. He is an ASE Master Tech since 1991 and has achieved L-1 certification for advanced engine performance. Mark is widely recognized and respected as an expert in his field and has been giving car repair advice on radio and TV since 1987. CRC Industries, Inc. is a chemical specialties manufacturer for maintenance and repair professionals and do-it-yourselfers in the automotive, marine, heavy trucking, electrical, industrial and hardware markets. 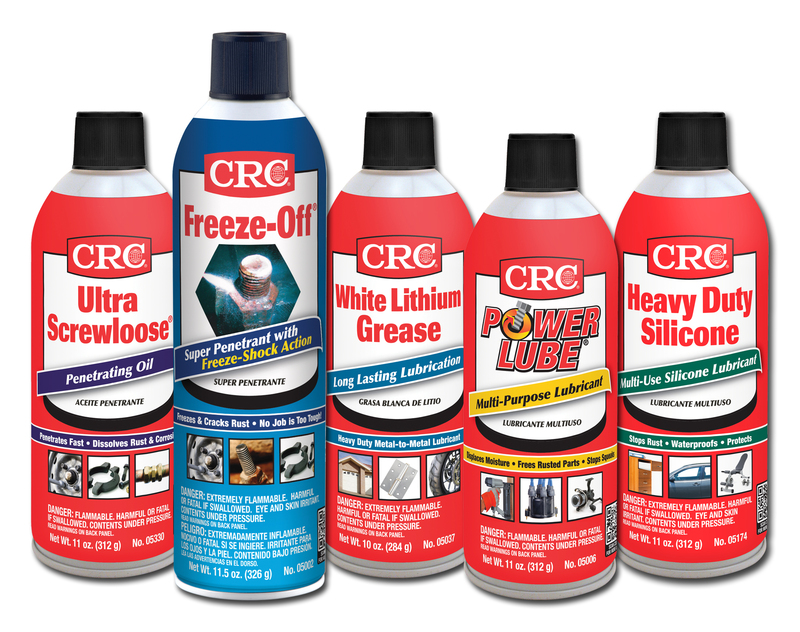 CRC trademarked brands include: CRC®, K&W®, Sta-Lube®, and Marykate®. Visit the CRC website at www.crcindustries.com/auto. CRC also encourages automotive enthusiasts, professional technicians and do-it-yourselfers to interact with the company on Facebook. “Like” CRC at www.facebook.com/crcauto.